All of our rehabilitation programs are designed, managed and evaluated by veterinarians. 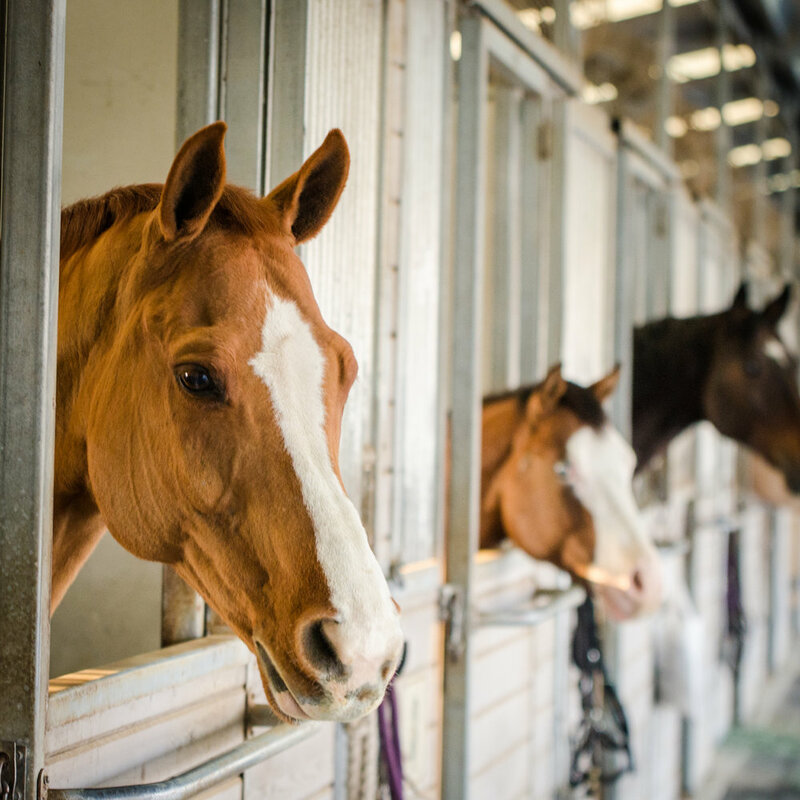 Our goal is to not only give horses their best chance of returning to full function, but to provide peace of mind to the referring veterinarians and owners. Customized veterinarian-designed and monitored therapy plan using a set program of exercises prescribed in conjunction with our consulting specialist, Nicole Rombach, PhD. Through specific muscle function testing techniques, Dr. Rombach will identify combinations of muscles that are either over or underactive. Through a combination of soft-tissue and joint mobilization techniques and muscle activation exercises, normal motor function pathways in the brain are restored. Movement retraining is an integral part of the rehabilitation process following treatment of an injury or after surgical intervention. Customized veterinarian-designed and monitored therapy plan using a combination of hydrotherapy and rejuvenating therapies. Our HydroHorse™ is an in-ground, submerged treadmill, with 1,400 gallons of heated water is a key component of many of our rehabilitation and fitness programs. The HydroHorse™ provides a controlled, buoyant environment for low-impact exercise, and speeds the return to fitness and performance. The underwater treadmill builds muscles and cardiovascular strength in a partially buoyant environment that reduces stress and concussion by up to 60 percent. The horse exercises in a controlled environment, in a straight line on a flat surface, using its normal gait, with full range of motion and the same muscles that it uses on traditional surfaces. 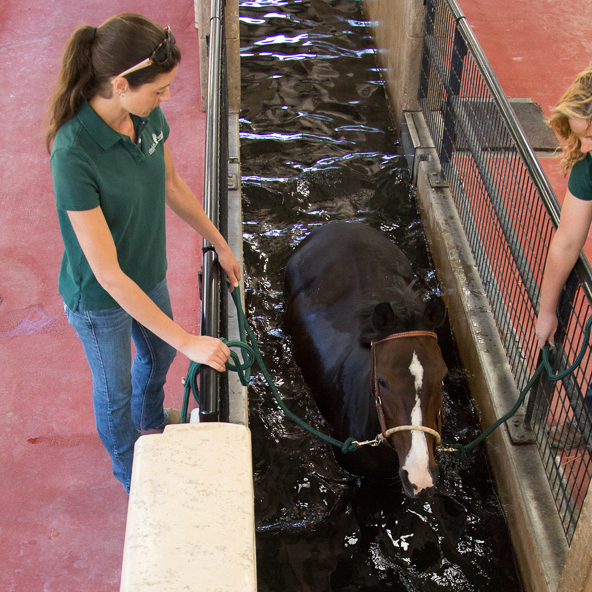 Unlike swimming, which uses a different set of muscles and does not replicate the workout that the horse receives on land, the HydroHorse™ builds topline and leg muscles with the added benefits of the therapeutic effects of the warm water and Jacuzzi jets. 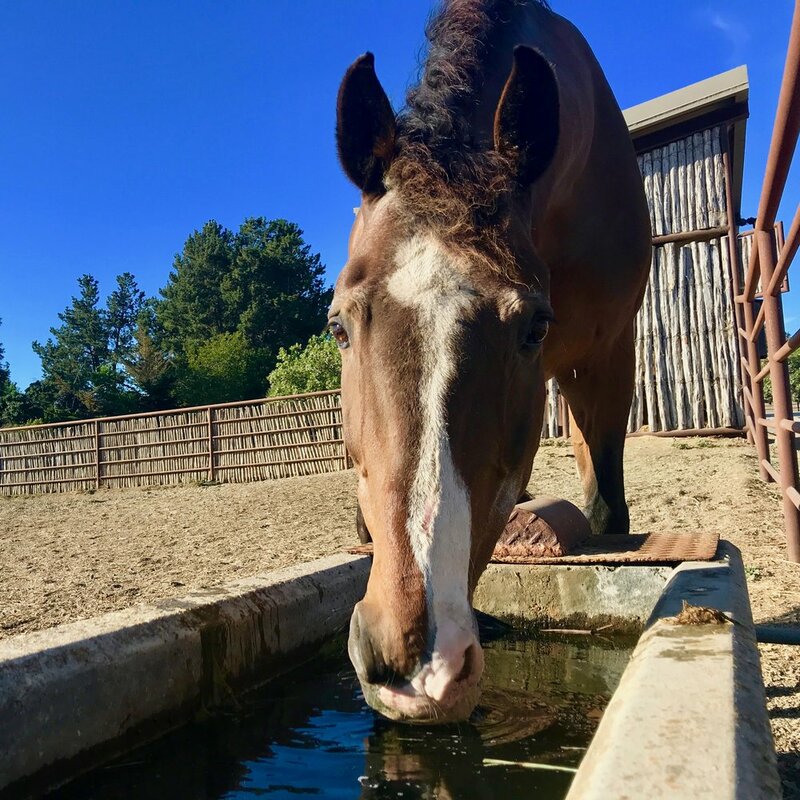 Our ECB Equine Cold Spa is a great treatment option for many of our rehabilitation patients and is incorporated into many of our rehabilitation programs. The salt water in the cold spa is chilled between 35°F-37°F, providing the salt solution carefully maintained to provide optimum treatment conditions. The water depth is adjusted depending on the location and severity of the injury . This is just a small list of the many conditions that the cold spa can help to treat: tendonitis, desmitis, arthritis, laminitis, synovitis, wounds, dermatitis. Our custom-designed Trojan free flow exerciser was designed specifically for us with a larger, 70-foot diameter to allow more room for the horses and to accommodate large breeds easily. The large diameter also means that the horses move in a broad circle and allows them more direct forward motion, with less torque on joints. The compartments are roomy and divided by flexible panels that minimize risk of injury. The footing is sand and rubber which is irrigated and worked regularly to provide an even, safe surface, reducing stress on legs and joints. The cover allows use in inclement weather (and protects the footing) and sits high enough so that even large horses have plenty of room to exercise freely. For the performance horse that has earned a comfortable retirement, Circle Oak offers the finest in equine accommodations and care. Located in lovely Sonoma County, we are just over an hour from San Francisco Airport. Combining the professionalism of a veterinary hospital with the personalized attention of a top-notch spa, our commitment is to give your horse unparalleled care in his well deserved retirement. The staff of veterinary assistants that performs the treatments and therapies on our rehabilitation patients also attends to our retired guests, and our Medical Director is always available for consultation. All horses are examined daily, including a full body wellness check, grooming and feet cleaning. Horses are regularly bathed and handled to ensure that they do not develop problems or bad habits. Assistance to veterinarians and farriers is included in our board rates, as is blanketing and worming. We also design care, exercise and nutrition programs specifically for retired horses and provide for their comfort, focusing on any health issues that need special attention. You may use your own veterinarian and healthcare professionals or our team of staff and consultants. At Circle Oak your retired horse will join a first rate program designed for optimum comfort, health, safety and longevity. Our retired competitors, who come from all disciplines, live in large, deeply bedded stalls with individual ¼ or ½ acre paddocks specifically designed for the needs of the retired performance horse. The larger paddocks boast 16’ x 16’ stalls with 12’ x 44’ porches over sand footing. We also offer accommodations for pairs of horses that want to live together—each with a 12’ x 16’ bedded stall and a shared ½ acre paddock. For horses that prefer the companionship of small groups of compatible horses, we offer a large pasture with a roomy shelter. All accommodations allow ample freedom of movement and the opportunity for year-round grazing. We pay particular care to pair compatible horses across fences or in small groups, ensuring that all horses live in harmony and stress-free environments.